Somehow Mika has developed an addiction for pinecones. I think it all started at the Nihon Ken Long Beach Meetup. There she saw Ichigo, fellow Shiba Inu, chew on a pinecone and Kurenai, Shikoku Ken, also chew on a pinecone. Before that meetup she would walk by pinecones everyday and never stopped to think about picking it up. 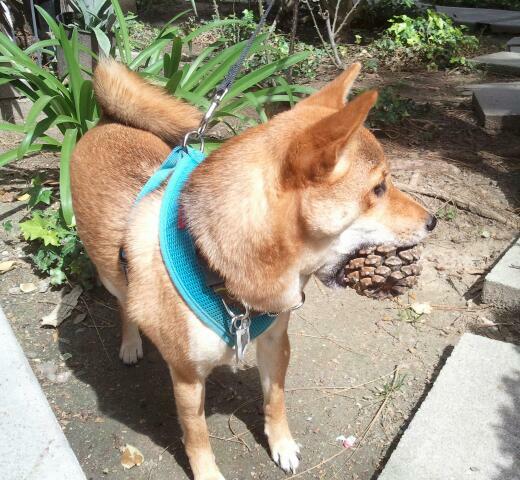 Since the meetup, whenever she sees a pinecone she has to grab it and trot around with it in her mouth. I really need to get a video of her when she's walking proudly with a pinecone in her mouth. It is the cutest thing ever. Anyone else with dogs that love to carry something in their mouth while they are on their walks? wish we had more in arizona! sticks are a close second.